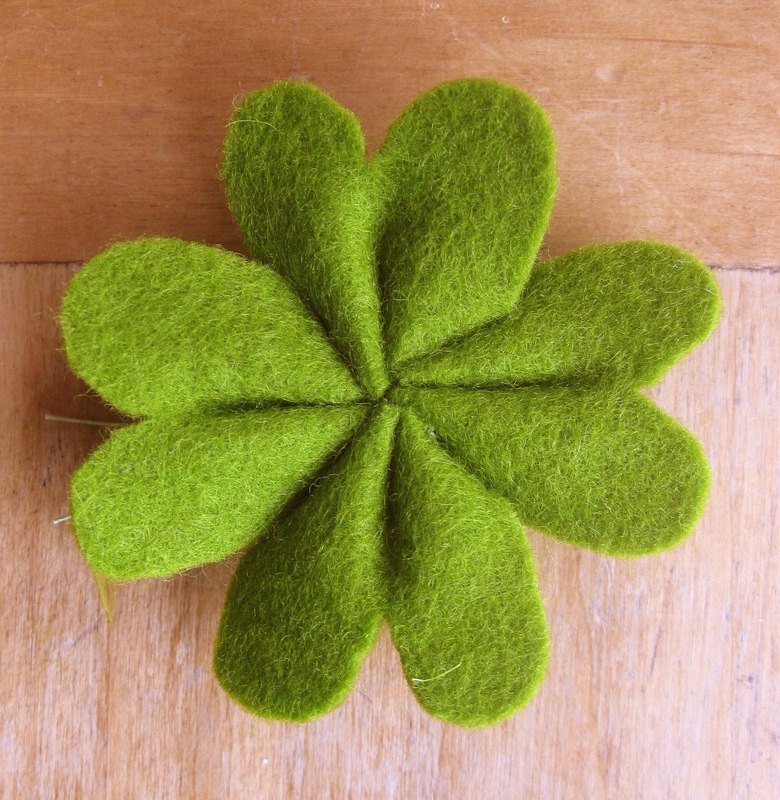 add some luck to your little ones day with this lucky clover barrette. i changed the shape of each petal to have two lobes each, and flipped the flower over, preferring the shape of the bottom of the flower for the clover. cut 4 leaves in the shape shown above. mine measured about 3/4 of an inch tall, and nearly an inch wide. sew the leaves together as shown above, and tie the threads together tightly at the ends. sew to a barrette, and clip on your little lucky charm. Hihi! New to your blog! I found you through your seeded paper boxes on D*S! SO lovely! 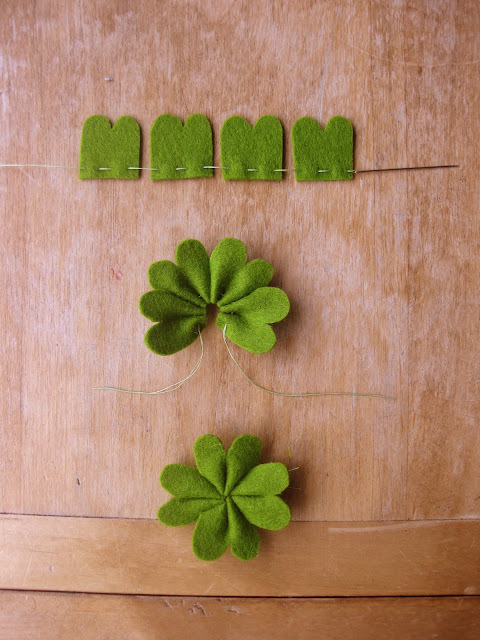 I am equally in love with your shamrock barrette; I will definitely be making one (or more!) of these for my St. Paddie's get up! Thanks for the great ideas, and I'll be sure to pop in frequently! thank you for sharing this is simply cute! I've had these pinned on Pinterest for awhile and I'm finally getting around to actually clicking on some of my pins. These are so adorable and can't wait to make these come next spring. For today and every day." Looove this! Just turned it into a garland and shared your tutorial on my blog today. So simple and cute. I used coordinating shades of green and attached a button in the center!! Hi! this would be perfect if you didn't call it a Shamrock. The reason Shamrock is important in relation to St. Patrick is that he used its THREE leaves to explain the "Holy Trinity" to the (at the time) pagan Irish. It is very, very important to Irish people that others don't get confused between "The luck o' the Irish" - for which a four-leaf clover is appropriate and St. Patrick's Day. UnderMeOxter: Delete one "leaf" and put a stem in its place. They turn out adorable!! Just found this on Pinterest! So cute! Cute! I've pinned this. Thank you! Took me a bit of work to find the original source, but glad I did! I used your tutorial to decorate my mantel! Thanks for this! I will have my students make them! So cute...will be making them for a mantle garland.